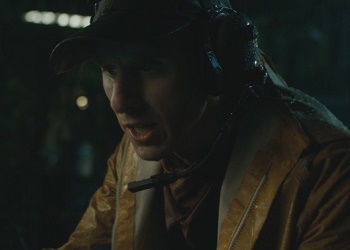 Jack was a mercenary employed by Eli Mills to undertake an operation in 2016 to retrieve Indominus rex DNA from Isla Nublar. His primary task was controlling the gates to the Mosasaur Lagoon to allow the submersible Marine One entry to retrieve the sample, the Indominus having been dragged to her death the previous year. 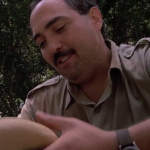 Despite Jack being the tech operator on a mercenary team, he was shown to be easily startled, as seen when an unseen Dilophosaurus scampered through nearby foliage, and his growing concern for Marine One’s radio silence. Jack never discovered the fate of Marine One, as the commotion of the operation attracted the attention of Isla Nublar’s resident Tyrannosaurus rex. Despite the urgent warnings from his teammates on a helicopter, Jack never noticed the theropod until she was quite literally on top of him. When Jack finally found himself face to face with the carnivore, he screamed in terror and made a dash for the helicopter with the Tyrannosaur in hot pursuit. In the ensuing chaos, Jack dropped the tablet he had been using to control the lagoon gates, which was subsequently crushed underneath the Tyranosaur’s foot. As the Tyrannosaurus made one final lunge for the mercenary, Jack jumped for the ladder that had been lowered. However, the Tyrannosaur managed to grab a hold of the ladder itself, engaging in a tug-of-war match with the helicopter. The lead mercenary, wanting to save his mercenaries aboard the helicopter, ordered for the ladder to be cut down. As the other mercenaries argued over the fate of Jack, the Tyrannosaurus managed to save both the helicopter and Jack, albeit unintentionally. She tore the ladder in half, resulting in the helicopter to make its getaway. Jack and the others cheered for his miraculous survival, but the celebration was short lived as the Mosasaurus breached out of the water, snatching Jack and the remaining piece of the ladder. The mercenaries in the helicopter looked on in horror as they flew back to bring Dr. Henry Wu the DNA sample. With the Tyrannosaurus having destroyed Jack’s tablet, the lagoon gates were also rendered permanently open, resulting in the Mosasaurus‘s escape into the wild, and rendering her safe from the impending eruption of Mt. Sibo. Jack was portrayed by Robert Emms.